This day I come to you all with good News! Today I come to you with glorious news! Today I come to you with a message concerning our glorious eternal home. Our home will be the New Jerusalem; it will be the place where we, God’s redeemed children, will live forever and shine as the stars for evermore. We will be thrilled as we are looking together at the last two chapters of God’s word, – Revelation chapters 21 and 22. Many Christians suppose that our future eternal state is a closed mystery that cannot be known. They either suppose that we can’t know in this life what our future state will be like or they have strange and weird suppositions of heaven. Such people often quote from First Corinthians, chapter 2, verse 9, which says – No eye has seen, no ear has heard, and no mind has imagined what God has prepared for those who love him. They quote this verse, but completely fail to read and assimilate the next verse, verse 10. We read here one of God’s wonderful ‘buts’! We go on to read in verse ten, “….But it was to us that God revealed these things by his Spirit. For his Spirit searches out everything and shows us God’s deep secrets”. The Holy Spirit is telling us through the writings of the apostle Paul that although we cannot fathom out heaven’s reality with our limited brains, the Spirit of God plumbs these deep truths and reveals them to us. My Christian friend, God wants to make your future eternal destiny very real to you! Of course we can never know fully the marvellous things that have been prepared for us, but we can know enough to thrill out hearts and inspire our vision. We can know enough of eternity that when we enter it – it will NOT be strange to us, because we have already had a foretaste of it and also been thrilled with the vision of it. Col 3:1, 2 – Since you have been raised to new life with Christ, set your sights on the realities of heaven, where Christ sits in the place of honor at God’s right hand. Think about the things of heaven, not the things of earth.’,. Rom 8: 17, 18 – since we are his (God’s) children, we are his heirs. In fact, together with Christ we are heirs of God’s glory. But if we are to share his glory, we must also share his suffering yet what we suffer now is nothing compared to the glory he will reveal to us later.” (Rom 8:17,18). Verse 17 is teaching us that we are actually to be co-heirs with Christ. The New Jerusalem will be a place of incredible glory and beauty. It is a possibility that our eyes will be able to see many colours that we were unable to see on earth as well as musical sounds we cannot even begin to imagine now. Every sight, every sound will be satisfying, completing and harmonious to us. You will never look at a wall again and think, “ this wall could have been a little different in color”. We will love one another and enjoy harmonious relationships in a way that we can never imagine now. The greatest joy of all however will be that we will forever be able to see the loving face of the Lord Jesus whom we will love so much. His precious Name will be indelibly imprinted on our hearts and minds! The greatest joy will be to forever discover new facets of His grace, kindness, love, personality and majesty! (Rev 22:4). So let’s begin to read together from the book of Revelation, chapter 21. We will read the first four verses together. We are reading from the New king James version. 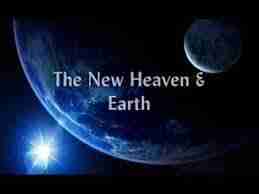 There is coming a NEW heaven and a New Earth. This passage echoes Isaiah 65: 17 – behold, I create new heavens and a new earth; And the former shall not be remembered or come to mind. The time is surely coming when the first heaven and earth which were created according to Genesis 1:1 will be “rolled up” and changed. God will create a totally new heaven and earth. The first creation had known the ‘touch’, contamination and presence of sin and the curse. God will create a pure new creation full of righteousness. Two other passages of scripture speak of this new creation. They are found in the Book of Hebrews and the second epistle of Peter. Heb 1:10 to 12 – (speaking of the Son): You, Lord, in the beginning laid the foundation of the earth, And the heavens are the work of Your hands. 11 They will perish, but You remain; And they will all grow old like a garment; Like a cloak You will fold them up, And they will be changed. But You are the same, And Your years will not fail. 2 Peter 3:12 to 14 – the heavens will be dissolved, being on fire, and the elements will melt with fervent heat? 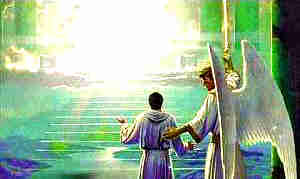 13 Nevertheless we, according to His promise, look for new heavens and a new earth in which righteousness dwells. As we God’s children have lived out our lives through this world we will have encountered many pains, hardships, struggles, persecutions, tribulations there. At times we may be tempted to feel that these tribulations should not be. Some of God’s children are even tempted to think that God cannot possibly care for them, allowing them to suffer in this way. But through it all, every trial and hardship as well as every satanic opposition we encounter will have had a purpose and is bringing forth God’s own nature into the fabric of our lives. (Rom 8:28). If you have enjoyed this message so far and perhaps you would like to share with me some of your thoughts on ” heaven”. then please add your comments in the COMMENTS space below..
One Response to What is Heaven Like?